History is not what happened. History is what you can – or choose to –remember. However our local history these days is being written by three sets of political actors with a triad of distinct powers of recall. Howbeit this unholy trinity morphs from one form of actor, the naïve or nostalgic politico, into another dangerous shape, the narcissistic player upon nationalistic sensitivities. Here’s my understanding of how these heroes and zeroes are sketching out the writing on your wall and mine. History is what has happened within living memory. As “location, location, location” is the clarion call of architects, so “context, context, context” is the rallying cry of political architects. For the purposes of this piece, I shall limit my context to recent history. That is to say, the time after our protracted civil conflict – really, a horribly uncivil conflict, for war is hell – ended. Since then, two combative camps have each trumpeted their respective victories. First, the victors of our late great military engagement with the once much embattled enemies of the state did it. Then, the victors of the battle for prime political space (it was a famous victory), who transformed a post-war debacle about who ‘won’ into a post-conflict debate about ‘win-win’ outcomes also did it. But, soon enough, in Jan 2015, the military victors were to become the politically vanquished. In their failure from 2009-15 to address the then or still pressing national need to trans-locate our war-torn isle from a post-war realm to a post-conflict society, the regime then in power reversed its triumphal (and unashamedly triumphalist) victory into an opportunity for that other avatar of its enemies at the gate: democratic-republicanism. (Or perhaps it was only a political machine disguised as a people’s movement.) Before long, the very same fickle mob that roared its approving hosannas at the vanquishing of that hated Other in the battlefield was literally queuing up to vote with its feet and thumbprint-inked pens for a new victor in a new arena of war. Hallelujah! Blessed are they who come in the name of peace and prosperity for all! Then, after barely two years in power (or service, as they like to position it), the victors of this strategic political battle – to take back the country from oppressive fear of its feudal overlords and opprobrious family-oriented cronyism – found themselves under siege. On the one hand, the vaunted coalition against corruption was besieged by an unwanted nationalistic joint opposition that is neither mutually supportive of its constituent parties except that one man’s – no, one dynasty’s – ambitions unite them… Nor is it properly an opposition, save that it undermines national government at every opportunity – And not in the national interest, but by bowing its knee to partisan and even personal agendas. On the other hand, the coalition itself has bowed the knee to the battering ram of current internationalist agendas posing as fiscal relief and fiduciary interest in good governance. It has yielded its financial cities and towers – and never mind that the always thin veneer of noble, disinterested, politics had long since disappeared under a thick patina of pragmatism and realpolitik. ’Twas ever thus, ’twill ever be? Of course, the government of the day – as with any previously incumbent regime – has had to nail its colours to the mast as naïve pursuivants of the national interest; which is interpreted with business interest and civil apathy at best, or marching protesting aggression and parliamentary intimidation at worst. Normal form for Neanderthal politics. Natural for the more sophisticated statesmen in waiting to cite sweeping reforms as the order of the day. Nice for the citizenry to subscribe to a new political culture – at least of a necessity in theory. In reality, the coalition against criminality in the state apparatus as the status quo, against corruption in government as the given situ, has been hoist with its own petard. In fact, its clarion call now sounds distressingly like it was borrowed from the former regime which it roundly critiqued during that set of victors’ incumbency. What else can account for “Zero cases of torture under police custody”? Realpolitikally, it has been – or is seen as – prosecuting a war against political opponents (who, thankfully, are dirty rotten scoundrels, and thus unsympathetic to the public – who lap it up like caviar to the general). Really disappointingly, it has been plaintively apathetic to dirty rotten scoundrels in their own ranks (“they’re ours, after all!” à la Nixon on his US-supported despots overseas) who dot cabinet in general and parliament in particular. Could it be, then, that the victors in politics over the victors in war have become victims of their own principles and propaganda – that power tends to corrupt, and that personal ambitions corrupt others egregiously? Should we abandon the good that they are doing in terms of inculcating a much-needed and much-lacking spirit of consultation and inclusivity into the constitution-transforming process, just because some of them are clearly bad – no, rotten – eggs who find favour for friendship’s sake and other foul or fearsome reasons? Would our abandonment of the hope and trust we invested in them open the floodgates to that other, always lurking, and supremely sinister, enemy at the gate – a chauvinistic cabal led by diabolical demagogues? Which of these two victors – one a military vanquisher of internal threats, the other a champion of civil liberties with more than a little external help (or aid) – are you and I and the rest of our ilk willing to allow, that they should write or rewrite our contemporary history? Both sets of victors above have each undergone an interesting metamorphosis in the public perception. If not also in their own understanding of the way history has happened of late. For the military heroes first fell victim to the myth of their own invincibility and the sense of arrogant entitlement that came with it. For the political heroes have now fallen prey to the legend of their supposed integrity and the thin skin of privileged elitism that accompanies political messiahs of a particular class or persuasion. Sorry to say that both sets of these victors have become victims of their crippling circumstances, their tragic flaws, their enemies’ strategies, happenstance, and history. But over and above these once dominant agencies and their growing lack of independent instrumentality there are other victims crowding in at the edges. These victims are both corporate and individual persons who won’t allow their scribes and subscribers to turn over the page of history and begin to discover what posterity might have in store for them. They are the nameless, faceless, forty- or four-hundred-thousands: cannon-fodder to the ruthless legions that launched a last-ditch onslaught against a Tiger in its lair in the last stages of the war. They are the myriad missing or killed defending nation and/or notion, the desolate families and despairing friends of the abducted and those who have disappeared without trace off the face of the scorched earth, the voices of the lost from an almost voiceless past. They are the utterly recognizable names tagged to the eminently recognized names bandied about in café society, gravesides, social media sites. These will all – individually and collectively – not allow history to pass… without a plea for peaceful burial; a chance for justice (transitional or transitory, it is yet to be determined) to be done; a demand for historicity (what happened) to complete the inaccuracies of historiography (what we remember or choose to remember as having happened). These are our collective ghosts from a past which cannot be laid to rest – for something wicked this way comes … again. In every victor, there is something of a villain. The despotic desire of the dominant majority to inflict their insight, vision, worldview, on a pliant populace vanquished in war or defeated at the polls. In every victim, there is also some villainy. This softer tyranny that will not let us go, with its cold fury and hot tears of rage or outrage at crimes committed against them (couched as crimes committed against humanity). Maybe the reflexive protests of the Sinhala majority reflect the former. 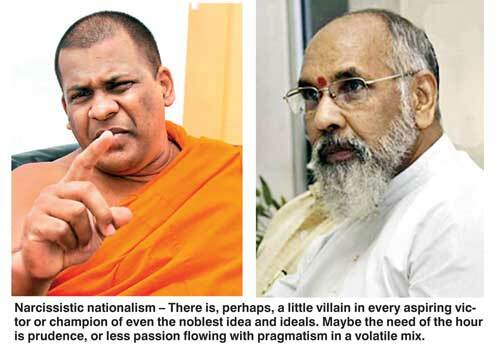 Except that in Vavuniya recently, where the ethnocratic BBS – a lone crusader for unabashed chauvinism – it was more the desperate desire of a dominant minority to regain lost ideological and phenomenological ground. Perhaps the softer tyranny of the Wigneshwarans of the world – no matter how you characterize the chief minister: as a champion of a noble idea on behalf of his community, or an inflamer of communal passions for personal reasons – is gaining some traction in an ideated North, to the consternation of unreasonable conservatives in the political South. Either way, it is of interest – and some cause of alarm – that both vociferous vocalists in their respective camps perceive themselves as victims: of happenstance as much as of history. Either way, these competing nationalisms and their inflammatory grandstanding threaten to open a dread new chapter in the ongoing history of an imaginary isle… Where ignorant armies clash by a night that is falling again – While ideological battles turn nasty in the light of a day where the centre cannot hold, the worst are full of passionate intensity, and mere anarchy is looking like it may be loosed upon the world again. All of which returns us to the perhaps rhetorical question that this columnist posed mid-piece. Which of the victors or victims are we to allow to dominate the stage of history today, with our power to speak out in dissent and our ability to control to some extent by censoring or censuring in the media and other forums? What will civil society continue to accept as par for the course in a post-conflict society struggling to be born as a newly being-formed nation-state? Are we to watch in silence as the narcissistically wounded victims of a chauvinistic ethnocracy (not to coin a phrase) strut and fret their petty hour upon a pathetic stage? Or wait in forlorn hope while the victors at centre-stage plot to stay in power at the centre come what may, treating the ethno-political Punch and Judy show being staged as yet another spectacle to be managed until local elections or global eventualities or both force the victorious coalition apart?